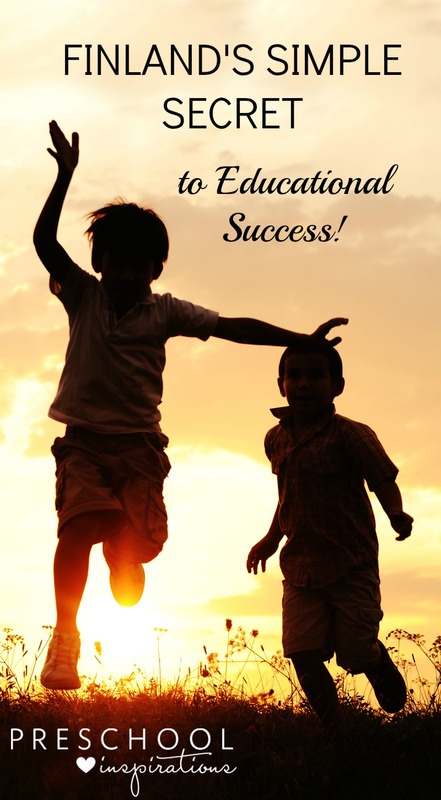 A few years ago I started hearing about Finland’s crazy success within the educational system. Finnish students have some of the best test scores in the world. Teachers love working there, and they are well paid. But children don’t even begin school until they are seven-years-old. This hardly lined up. I was on a quest to find out more about Finland’s educational success. I have been waiting for a book to be released about this fascinating educational philosophy. Can Finland’s success be duplicated? That’s what I really wanted to know, and when I was offered a copy of the newly relased book, Teach Like Finland, I wanted to dive into it right away! When I first started teaching, I was convinced that children would learn most if I was an incredibly dedicated and sacrificing teacher. This meant impeccable lesson plans, the best resources, the newest educational supplies, carefully planned circle times, and schedules planned to the minute. I would eat, sleep, and breathe being the “perfect” teacher. That worked for about five years before I started to realize that I just couldn’t keep it up. Teaching felt more like paperwork, meetings, and exhaustion. And while I had a passion for my students, it wasn’t enough. All of the monotonous administrative requirements that I used to do without a second thought were leaving me frustrated and exhausted. It was taking most of my positive energy and deflating it. For several years I just felt lost. My days were spent meeting standards, analyzing data, filling out reports, and wondering if this was what teaching would feel like forever. I went into teaching to work with children, but it started to feel like being with the children was more of an afterthought. After almost a decade of teaching and administrating in American preschool programs, I stumbled into a new direction. I left the corporate preschool classroom and opened up my own preschool in my home. Little did I know that this would be life-changing. I went through a period of transformation and rejuvenation — perhaps even a time of healing. My students and I enjoyed carefree days where classroom stress was a thing of the past. There was still stress, but it was very different. My classroom paperwork was cut by at least 80% with my class of six. No longer did I have to make an incredibly detailed curriculum each week. Our learning was pieced together by my students and myself. I started to feel alive again, and I just enjoyed being present with my class. There was so much joy in watching them interact and search out their own interests. Through this process, I started to search out like-minded educators. One day I ran across an article that changed my whole perspective on education. I read about a place where children aren’t pushed to learn to read at five-years-old in the article “The Joyful, Illiterate Kindergartners of Finland” by Timothy Walker of Taught by Finland and contributor of The Atlantic. Instead, children are given the freedom to read when they were ready. This gave me fresh hope that there was a place in the world where kindergarten was not the new first grade. Finland’s education system was a place of refuge — one where children could be children and laugh and play and still learn all at the same time. I had to find out more! How does Finland make an education system work where young children go to school for only four hours a day? That even includes lunch. And why don’t children begin school until 7-years-old? How does a society that sends children to school for less time have some of the highest test scores in the world? Timothy Walker has authored a brand new book that has the answers to all of my questions about the Finnish education system. 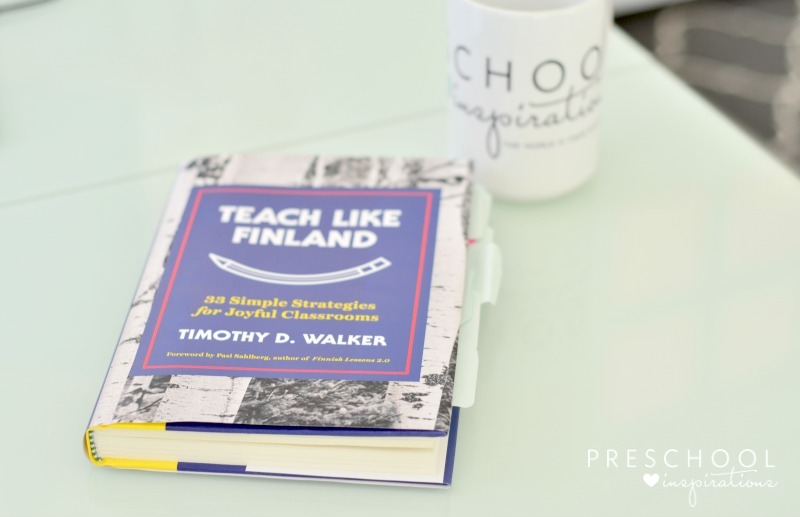 Teach Like Finland: 33 Simple Strategies for Joyful Classrooms is a practical way for teachers all around the world to implement the successes that Finland has discovered. While reading Teach Like Finland, I was especially intrigued by a section about the value of peace in Finland’s education system and culture. As someone who loves calm down bottles, peace corners, and calming environments, I was intrigued to say the least. There is a primary school in the book that Walker mentions that I just couldn’t get out of my head. It was a school that I wish my own children could go to or that even I could teach at. Who am I kidding? I would love to work at probably any school in Finland! Walker interviewed the principal of this school concerning some new rules that were about to take place. When asked about the main reason behind the new rules, the principal gave an answer I’ve never heard before. What a profound answer! While teachers all over are trying to figure out how to cram more in, Finland is implementing systems to promote mindfulness, to create calming classrooms, and to give children the opportunity to independently work in a serene environment for large blocks of time. Children are given the gift of time and quietness in the classroom. Schools in Finland focus on learning that is relaxing and stress-free. Learning is a collaboration between students and teachers. Outdoors is an extension to indoor teaching, not exclusive of it. There are hourly breaks where the children have recess. Classrooms are filled with nautral light and fresh air. Students and teachers don’t wear shoes indoors, and the classroom is a place of peace. According to the Finnish National Board of Education, “Learning is supported by a peaceful and friendly working atmosphere…and a calm, peaceful mood.” That’s on page 48. You’ll want to bookmark it! There is no mention of rigor, pushing students, or demanding more. When I look at my little in-home preschool and compare it to all of my other classrooms, I can see it there too. My biggest goal was to create and a calm and inviting classroom. The colors painted on the wall were carefully selected. The artwork I chose to hang up was intentional and not just to fill up space. I had a little bit of Finland in my very own home in Colorado, but I didn’t even know it. I did see that my students were thriving though, and I knew that there must have been something about our cozy classroom that was making learning feel like second nature. 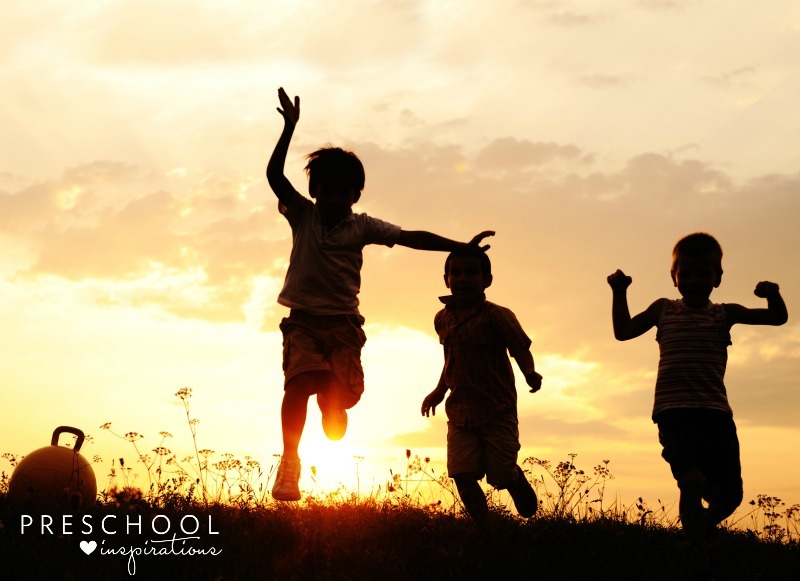 How does peacefulness and calmness help children learn? It seems almost backward, but giving children lots of facts to learn and memorize does not typically increase learning. In order for there to be maximal brain growth, the brain needs the ability to rest and to repair. In other words, the brain needs some time to process all the information that it is inputting and processing. Allowing the brain to experience boredom and quietness is like giving it a giant growth spurt. In a world where many nations view learning as a race and view accomplishments with the utmost importance, Finland shows us that there is another way. One that doesn’t leave students and teachers burnt out. One that includes a collaboration of ideas and minds and values the thoughts and interests of it’s students. Perhaps this peacefulness sounds too good to be true? Would implementing mindfulness really change the stress levels of students and teachers? Can life really be made better by making it simpler? I think so. Great post, Katie! The Swedish education system is very similar to the Finnish one, so I recognize a lot of this. I especially appreciate the lack of pressure on kids to start reading and writing early, and the shorter school days. Incorporating outdoor learning and movement is also a big part of elementary school in Sweden. I haven’t had a chance to read the book yet, but it sounds really interesting! Thank you, Linda! I love that you bring the best of Sweden to children in the U.S. and all around the world! The simple and comfortable teaching of Finland does not surprise me at all. Finns prefer simple things. Their surroundings like the old fashion just simple living. Nothing flashy nothing for show. I am a 100% Finnish American. Here in The USA even our parks look as if you went back in time. Thank you so much for sharing! Love reading your adventure and newer knowledge! I have a 4 year old and almost 1 yr old in rural Kansas. I’m married to a farmer, and we live 20 miles from any school (at least 1 hour one way on a bus!). I’m currently homeschooling preschool to my oldest, but still get him involved with other kids to play with weekly in our community. We decided to homeschool until at least age 7., after reading and reading articles similar to yours! And feel public school would add too much stress to our children and take away family time away (mostly bc of the 2 to 2.5 hours daily on the bus). I sure wish Kansas public schools were only 4 hours! Any ways, thanks for posting and sharing about those books too! Your life sounds like an incredible adventure, Leslie! I am sure your kids will have some amazing memories and incredible life skills. We did something similar with two of my children too (even though there were schools nearby). Looks like another book is going on my shelf. I wish I could work in a Finnish school too and see how it works. The kindergarten I started for my son and a few of our language school customers is doing well and it’s very peaceful most of the time so I must be doing something right.